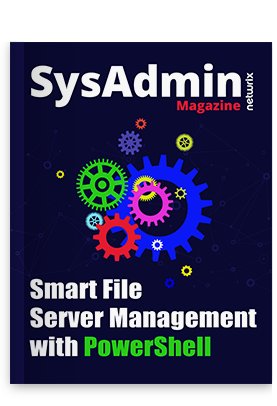 This error has made many people think they need to keep an Exchange Server up and running on their local network. Thankfully, that’s not the case. You can easily add an alias via Active Directory Users and Computers (ADUC). To do this, open ADUC and find the User you want to modify. Make sure that Advanced Features is checked, under View on the top menu. Double click on the User then click on the Attribute Editor tab. Scroll down to the Proxy Address field and double click to open it for editing. It may be blank, which is fine, or it may already have some information in it. 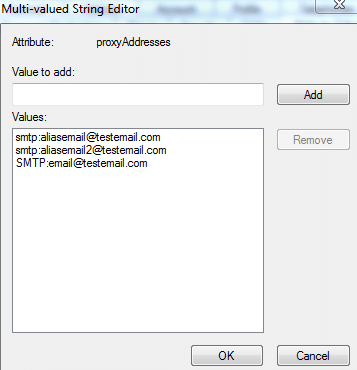 If it’s blank your first step is to add the existing email account in the format SMTP:email@testemail.com. Make sure to capitalize SMTP as that’s how the default account is determined. For the alias account you want to add, use the format: smtp:aliasemail@testemail.com. You can add as many aliases as needed, just be sure that they all use lower case for smtp. When done click OK until you are out of ADUC and then sit back and be patient. The cloud side will synchronize and show the new alias, but it isn’t always fast. You can do a manual sync via Azure AD Connect / DirSync, but even then it can take some time to appear on the O365 side of things.